Once known for its agricultural output, Contra Costa County is now home to rapidly developing communities. The 4,000 acre Cowell Ranch lies just outside Brentwood, one of the state's fastest growing cities. 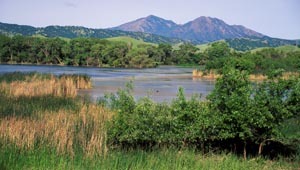 The ranch's oak-studded rolling hills, wetlands, streams and vernal pools are home to many threatened and endangered species including red-legged frogs, fairy shrimp, tiger salamanders and San Joaquin kit fox. After many months of negotiations and working with the community, TPL signed an exclusive option agreement to buy nearly all six square miles of the ranch that had been earmarked for a golf course and 5,000 single-family residences. In 2002, TPL transferred it to the California Department of Parks and Recreation, permanently protecting this classic California landscape and providing recreational opportunities for residents.